· TOWING MODE TO CONTROL: The drone could be easily controlled by a 2.4G remote control or smartphone. · Stable Flight: Built-in barometer with altitude maintenance function provides stable and easy to control flight. · Multi-functions: 3D-flip, headless mode, wifi FPV in real time transmission, gravity control of feeling, a return key, a takeoff/landing key, etc. · FPV REAL TIME TRANSMISSION: Equipped with 2.0MP WIFI camera, you have full control and you can take any photo and video you want. 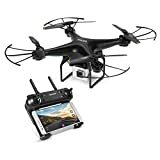 · Budget: Brand: GoolRC Model: T106 Main Color: Black Remote Control Mode: 2.4G Mode 2 Channel: 4-Channel Gyro: 6-Axis FPV: Wi-Fi Camera Resolution: 2.0MP Remote Control Distance: about 150 m Flight Time: 6-8 minutes Drone Battery: 3.7V 750mAh Lipo Battery Battery for Controller: AAA Battery 2 * 1.5V (No Included) Charging time: 50-70 minutes Battery size: 45 * 25 * 10 mm Dimension: 320 * 320 * 125 mm Weight: 129g There may be some deviation due to manual measurement.Caution for the battery: Do not overcharge or discharge the batteries too much. Do not put it next to the high temperature condition. Don´t throw it in the fire. Do not throw it into the water.Realize: This RC model is not a toy and is not suitable for children under 14 years old. Keep it away from children. Please read the instruction manual carefully before use. If you are a beginner, it is advisable to be attended by an experienced adult. Phone is not included.Package information: Package size: 27.5 * 20 * 7 cm / 10.8 * 7.9 * 2.8 inches Package weight: 427g / 15.1oz General Gift boxPackage list: 1 * T106 Drone 1 * Remote Controller 1 * Torque Landing Gear 4 * Propeller Protector 1 * Spare pair propellers 1 * USB Charging Cable 1 * Screwdriver 1 * Manual in English.